It's that time of year again, getting rid of another British aircraft carrier, and what to do with it? 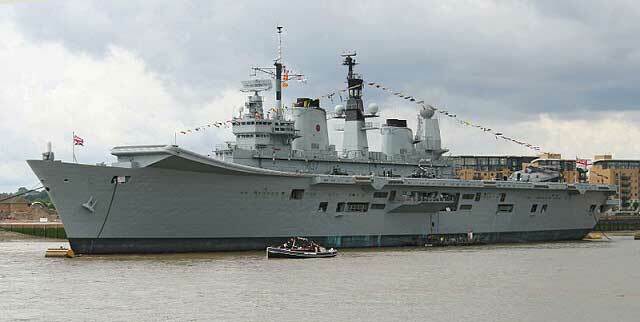 This time it's the Ark Royal, the third ship of the Invincible class, and the 5th to carry the name. She's only been on earth since 1981, but it's off to the scrap heap with her. Besides, does Britain have any carrier planes left? There are plenty of people that want the carrier, especially the Chinese. They want to make a floating casino out of her, like they wanted to do with the last British carrier they tried to buy. They sold the Russians that story too, and now that carrier is the first carrier of the Chinese Navy, and if the Brits let their guard down, the Ark Royal will be the second. A bunch from Devon would like to turn it into an artificial reef, and formed a charity called "Wreck the World" to accomplish this goal. They figure divers would pay a ton to dive on the wreck, and diving on sunken ships is quite a popular pastime. They've got the dough to pull it off, and seems like the best end for an old warship. Of course, keeping it in service would be the best end. Maybe someone will declare war on Britian. Then they'll patch it up.